Having lost large majorities in both houses of Congress, expect Obama to deploy his considerable executive powers. A glimpse of what to expect occurred near Christmas as the administration unilaterally issued three new regulatory rulings governing the Internet, greenhouse emissions, and federal wilderness areas. These actions taken by the Federal Communications Commission, the Environmental Protection Agency, and the Interior Department exhibited raw regulatory power. The FCC action defied a federal court. The EPA greenhouse ruling came even as the Senate voted last June to deny the agency power to issue rules over climate change. The Interior Department administratively reversed Bush-era rules on limiting wilderness protection. In the absence of the consent of the governed, we are seeing rule by decree. No mention of those Iranian missiles going to Venezuela. There was a Democratic President in the last century who thought that sort of thing was a pretty big deal. This one … apparently not so much. The study of cities might be called urbanology, or something like that. An area of sociology, perhaps. There does not seem to be much science to it. As described in "A Physicist Solves the City" in the NY Times Magazine, an actual scientist named Geoffrey West is working to put some science into what has been a matter of essays on lifestyles and matters of taste. If his work receives the followup it deserves, we may begin actually to learn something about the way that cities actually work. Found in Jerry Pournelle's mail. It is with great sadness that I am forwarding the attached letter – press release by the staff at the Research Unit for Applied Meteorology and Climatology in Agriculture (in Italian: CRA-CMA), the direct descendant of the first Italian National Weather Station inaugurated in 1876 and headquartered at the Collegio Romano from 1879 (in an area previously occupied by the Meteorological Observatory built in 1782 by Abbot Giuseppe Calandrelli (the first to apply gravitational theory to cometary atmospheres)). I hope that those who have taken this decision will go back on it, at least reconsider this meteorological site, by declaring its historical importance for Italian meteorology. That would mean leaving untouched its Library, Historical Archives and the Museum of Ancient Meteorological and Seismographic Instruments, as well as the historic Calandrelli Observatory. The Library is at present unique in Italy, after the closure, in the 1990s, of the Air Force Weather Service Library. How valuable is empirical evidence and long term data? The Collegio Romano is one of the few places in the world with multi-centennial meteorological and climate data series (228 years!) … Not many people in the world appreciate how important and rare those long temperature series and historic collections are. If the warmingists were really interested in science, this would be a big deal. Al Gore has made enough on climate alarmism to buy the place, single-handed. It's just as well, though, since the alarmists have shown what they think of data. Data are to be extrapolated, adjusted, inferred, or deleted. The actual records can be so, uh, inconvenient. Look at New Zealand for a current case, if you're tired of Phil Jones. Archie Bunker liked the wrong President. Of course he did. Archie was written that way. America missed a bet when Coolidge decided not to run in 1928. He would have been reelected in a landslide. If he had been in office, and the 1929 crash came anyway, he would have been able to follow Harding's example in dealing with it. The 1920 depression was a short sharp shock, followed by the Roaring 20's. I want the people of America to be able to work less for the government and more for themselves. I want them to have the rewards of their own industry. This is the chief meaning of freedom. Until we can re-establish a condition under which the earnings of the people can be kept by the people, we are bound to suffer a very severe and distinct curtailment of our liberty. Here is the text of his address at the celebration of the 150th anniversary of the Declaration of Independence. A few more links: David Bozeman calls Coolidge "The Great Un-Obama." Alan Snyder's article explains why he did not run in 1928. It reminds me of the way George Washington term-limited himself in 1800. Amity Shlaes calls Coolidge "The Great Refrainer." Shlaes and Joe Thorndike have been writing a blog devoted to Coolidge, Silent Cal. Thorndike's personal blog is thorndike dot com. Some notes on De Forest's sound film process, Phonofilm, here, here, and here. [The] country needs every ounce of its energy to restore itself. The costs of government are all assessed upon the people. This means that the farmer is doomed to provide a certain amount of money out of the sale of his produce, no matter how low the price, to pay his taxes. The manufacturer, the professional man, the clerk, must do the same from their income. The wage earner, often at a higher rate when compared with his earning, makes his contribution perhaps not directly but indirectly in the advanced cost of everything he buys. The expenses of the government reach everybody. Taxes take from everyone a part of his earnings, and force everyone to work for a certain part of his time for the government. When we come to realize that the yearly expenses of the governments of this country reach the stupendous sum of about seven billion, five hundred million dollars, we get [garbled] hundred million dollars is needed by the national government, and the remainder by local governments. Such a sum is difficult to comprehend. It represents all the pay of five million wage earners receiving five dollars a day, working three hundred days in the year. If the government should add one hundred million dollars of expense, it would represent four days' more work of these wage earners. These are some of the reasons why I want to cut down public expense. I want the people of America to be able to work less for the government and more for themselves. I want them to have the rewards of their own industry. This is the chief meaning of freedom. Until we can re-establish a condition under which the earnings of the people can be kept by the people, we are bound to suffer a very severe and distinct curtailment of our liberty. These results are not fanciful. They are not imaginary. They are grimly actual and real, reaching into every household in the land. They take from each home annually an average of over three hundred dollars, and taxes must be paid. They are not a voluntary contribution, to be met out of surplus earnings. They are a stern necessity. They come first. It is only out of what is left, after they are paid, that the necessities of food, clothing, and shelter can be provided, and the comforts of home secured, or the yearnings of the soul for a broader and more abundant life gratified. When the government effects a new economy, it grants everybody a life pension, with which to raise the standard of existence. It increases the value of everybody's property, raises the scale of everybody's wages. One of the greatest favors that can be bestowed upon the American people is economy in government. That's "economic struggle," or trade warfare. The European politicians who pushed it care less about absolute prosperity than relative prosperity. They're okay with hurting their economies if ours is hurt more. But she was too kind to those European politicians. The original impulse to take action had come from the German Physics Society, which in January 1986 published a “Warning of an Impending Climate Catastrophe.” Just over six months later, in August, the newsweekly Der Spiegel popularized the German physicists’ “warning” in a spectacular cover story headlined “The Climate Catastrophe.” The image on the cover of the magazine depicted Cologne’s historic cathedral surrounded by the waters of the Atlantic Ocean: a consequence of the melting of the polar ice caps, as was explained on the inside of the issue. Thus was the “global warming” scare born. In Germany, in 1986. The whole protocol, or "framework convention," was carefully tailored to fit events in Europe. It's no coincidence that the base year for most countries in Kyoto was the year after the Berlin Wall fell. The real questions that Americans need to ask concern their own negotiators. How could they have permitted the United States to be boxed into such an obviously prejudicial corner, and why did neither they nor the Clinton administration as such do anything to expose the ruse? The Senate at least saw through it, and refused to ratify, 95-0. Here's the actual Senate resolution (pdf). So the 95 "Yea" votes are votes against adopting the treaty. The science has always been secondary to the politics. We can start by ratifying the Kyoto Protocol. One of the dumbest things that President Bush said -- and that's a high bar -- is that Kyoto would cripple the U.S. economy. I think the opposite is true. * I was using my real name on the Internet in those days. The Anglosphere Challenge was published in 2004, and it was shortly after that I grew tired of having to explain over and over again that I was not the author of that fine book, but someone else entirely. … as a new critique of the conversion from the Mayan suggests, some recalculations may be in order. It's a good news/bad news situation for believers in the 2012 Mayan apocalypse. The good news is that the Mayan "Long Count" calendar may not end on Dec. 21, 2012 (and, by extension, the world may not end along with it). The bad news for prophecy believers? If the calendar doesn't end in December 2012, no one knows when it actually will - or if it has already. A new critique, published as a chapter in the new textbook "Calendars and Years II: Astronomy and Time in the Ancient and Medieval World" (Oxbow Books, 2010), argues that the accepted conversions of dates from Mayan to the modern calendar may be off by as much as 50 or 100 years. That would throw the supposed and overhyped 2012 apocalypse off by decades and cast into doubt the dates of historical Mayan events. Not the robosigned mortgages causing such an uproar among the bankers, but "the 10 Most Ludicrous Musical Instruments Ever Conceived." All are described and presented with videos so that they can be seen and heard. All are unfamiliar to me, and for most of them, I'd just as soon they stay that way. There might be a future for the violimba in horror movie scores. The Samchillian Tip Tip Tip Cheeepeeeee, a keyboard "based on relativity," is intriguing and might actually have a future. Or it might be from the future. … is the name of a blog devoted to, guess what? I read the whole thing and didn't even need an Alka-Seltzer afterwards. Recommended for anyone who has debated the merits of different brands of potato chips and cheese puffs, and, really, who hasn't? The bill is S. 3804, the Combating Online Infringement and Counterfeits Act, or COICA. (Full text.) It has 16 co-sponsors, including a few Republicans. Commentary and comments at Techdirt, PC Mag, Fox News, ZDnet (Australia), EFF, and elsewhere. Internet advocates warn the legislation would open a door for a handful of people in the federal government to wantonly power off entire websites that may be operating legally under current law. Though senators suggest the bill would save jobs by cracking down on piracy, critics say it will hurt the economy by threatening fledgling companies whenever copyrighted material shows up on their sites. "If this bill had been law five or 10 years ago, there's a good chance that YouTube would no longer be around," Peter Eckersley, senior staff technologist at the Electronic Frontier Foundation, told FoxNews.com. Eckersley said the bill would mark a drastic departure from current law by allowing the government not just to strip copyrighted material off an offending website, but to order the shutdown of a domain name altogether. Eighty-seven engineers who played a role in the creation of the Internet have sent a letter to the Judiciary Committee urging it to sideline the bill. "If enacted, this legislation will risk fragmenting the Internet's global domain name system (DNS), create an environment of tremendous fear and uncertainty for technological innovation, and seriously harm the credibility of the United States in its role as a steward of key Internet infrastructure," they wrote. "All censorship schemes impact speech beyond the category they were intended to restrict, but this bill will be particularly egregious in that regard because it causes entire domains to vanish from the Web, not just infringing pages or files. Worse, an incredible range of useful, law-abiding sites can be blacklisted under this bill." They can't keep their grubby paws off. Leahy has been in office far too long. All the political crystal gazers seem to think that there's no chance he will lose this election. I'll be hoping for Len Britton to surprise them on election night. It's a shame that the Republican Party is not supporting its own candidate. Update: David Post at The Volokh Conspiracy says that COICA is "a truly awful bill." What to Do If Hackers Steal Your Online Accounts. Everybody's seen this by now, right? The video produced by the environmental group 10:10.org with the red button and the people getting blown to bloody bits for being indifferent about this environmental action. Richard Curtis, Gillian Anderson, Radiohead, so on and so forth. Treacher has found a video response. Taranto and commenters at the WSJ have commentary. James Delingpole has a couple more examples of the enviro-terror genre. Nothing new about this. Paul (Sea Shepherd) Watson's call for ~6,000,000,000 deaths, as soon as possible please, is still on the Sea Shepherd website. James Hanson was calling for trials for AGW deniers, not so long ago. Paul Krugman used the expression, "traitors to the planet." The penalty for treason is death. Lefties, "progressives," enviros, what have you, they don't see human beings. They see economic units, or classes, or elements of the dialectic. In connection with which, Andrea Harris wrote about "The people Obama doesn't see." She also has a piece about the 10:10 video. In the fantasies of "environmentalists," somehow all those awful people just disappear, but the dreamers are spared to view the resulting Paradise. That will only work if the environmentalists supervise the slaughter themselves. In the 10:10 video, the fuzzy teddy bear mask slipped. Added: Andrew Bolt has a couple more of these toxic ads. Via Hot Air. S. Weasel has a recycling ad. Ed Driscoll has a post with many links, and a follow-up. Eric S. Raymond writes, "From now on, this video should be Exhibit A whenever the global-warming alarmists pretend to moral or intellectual superiority over the rest of us." Representatives Joe Barton, Michael Burgess, and Marsha Blackburn have just introduced the Better Use of Light Bulbs Act (or BULB). The legislation would repeal the de facto ban on the incandescent light bulb contained in Subtitle B of Title III of the Energy Independence and Security Act of 2007. It's H.R. 6144, for those who care about that sort of thing. There is some vaguely scientific sounding noise being made in certain quarters about health hazards of compact fluorescent bulbs. For some reason that I don't understand, most of it seems to be in the form of videos rather than articles. A number of these are assembled for your viewing pleasure at CFL Impact. I find it offensive that the ban has no justification other than that incandescents are inefficient. That's a matter of one's perspective. A CFL is terribly inefficient, in fact downright ineffective, in an Easy-Bake oven. And since when has mere inefficiency been a reason for legislation to outlaw anything? If something is inefficient enough, people will stop buying it. Non-radial tires have just about disappeared, without ever being banned. For instance. Even though radials are more expensive. The better product naturally supplants the worse. Yet bias-ply tires are still available, if you want them. Now that there have been two failed attempts to repeal the 1099 madness in the health care bill, I do not have much hope for this first attempt to repeal another piece of lunacy. But hope springs eternal, I suppose. Hope for a change in direction. Yes, I'll have a cup of tea, thanks. Added: Peg at "what if?" appreciates her incandescents. Doctor Zero cuts through the claptrap: "No more control"
Political control is what’s killing us. 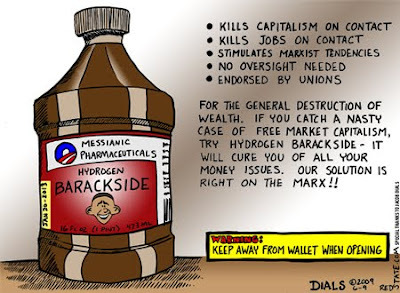 It is expressed in hundreds of ways: high tax rates with carefully tailored exceptions, massive bailouts, laws rigged to favor government-controlled industries, restrictions on resource development, and a vast poppy field of subsidies and penalties. The Democrats have added thousands of pages of fabulously expensive legislation since Obama took office. Two messages echo through those pages: Obey and be rewarded. Resist and be punished. Can Republicans run on light bulbs? An issue for the election coming up. Do people even know this is coming? I wonder how many do. Discussion at Althouse, occasioned by the closing of GE's last US light bulb factory. Thanks to Neo-neocon, an important article by Dinesh D'Souza, How Obama Thinks. This piece is a must-read. Update: D'Souza talks about it some more. John Benson, stonecarver, calligrapher, sculptor, singer, fiddler, friend, narrates a short video about himself and his work. The stone-carving shop in the video is the John Stevens Shop in Newport, Rhode Island. John will be showing some of his work at Imago Gallery in Warren, Rhode Island, starting today, August 27. Update, Sept 29: John's son, Nick Benson, who has run the John Stevens Shop since John retired a decade or so ago, has been named a MacArthur Fellow. He speaks about it in this video. … with a poet. I have mentioned Gerard Manley Hopkins here before. For an appreciation, and another poem, go visit Sheila O'Malley. You won't regret it. On the wall of Four South at Wayne Memorial in Honesdale, Pennsylvania. There was no author or title given. Apparently Cameron invited a couple of AGW skeptics (and Andrew Breitbart) to debate with him on the topic of AGW, at an event called the American Renewable Energy Summit. At the last moment he rescinded the invitations. Meanwhile, Cameron attended the event on Sunday and used the platform to say of those who question man-made global warming: “I think they are swine." Insulting empty chairs is always a good debating strategy. Sharon Waxman has the story. Thanks to Glenn Reynolds. His grandiosity: Still not getting it about Obama. His racial dog-whistling: Obama the great bamboozler. "You were doing it wrong"
What in life did it take you a surprisingly long time to realize you've been doing wrong all along? "Crap, I've been doing it wrong." We've all had those sudden epiphanies where we realize we've been doing something incorrectly, ineffectively or just suboptimally our whole lives, in domains from handicraft to human relations to technical stuff to personal grooming. What have you spent large portions of your life doing wrong? The first answer: "Tying my shoes." Many people have problems with words such as segue and epitome. Another answer up near the top is "It took me until adulthood to realize that courage, tenacity, and hard work get you a lot farther than plain old smartness." So there are all kinds of things posted here. I was pleased to discover howjsay dot com, an English dictionary of pronunciations. Just pronunciations, no definitions, and it is English, so "balmy" is pronounced as "barmy," and so forth. Another discovery would be this video, demonstrating how to tell when the pan is hot enough. That video is extracted from a post at Houseboat Eats which explains the whole thing much more fully. Mirrors are a recurring theme in the thread. I learned of this from Prof. Althouse, who learned of it from her son John Althouse Cohen. Metafilter mods are not pleased with the thread and might have killed it, if they had not been distracted, as is revealed in another thread called Doing it right. I've heard it said that one can save money by buying good stuff and taking care of it. 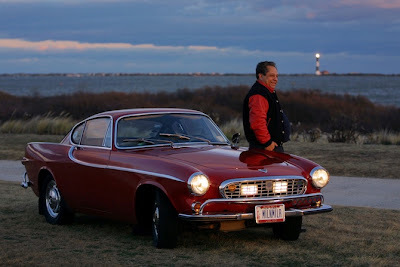 Case in point: Irv Gordon, who recently turned 2,800,000 miles on his 1966 Volvo P1800. Irv Gordon has some advice for keeping your car running forever: Follow the factory service manual, replace worn or broken parts immediately and don’t let anyone else drive your car. Some say, "Run Your Car Into The Ground: It's Cheaper" when what they mean is that if you don't have to buy a car every few years, but can just do maintenance on the one you already have, you'll save money. You don't actually have to run it into the ground, if you can manage to keep it above the ground. -  Almost 100 times around the world (via the equator). -  Nearly five round-trips to the moon. -  1,111.111* completions of the Tour de France (*recurring). -  7,104 swims across the English Channel. -  More than 114 Great Races (New York to Paris). Via AoS HQ. I had a '64 Volvo 122-S Amazon for a while. (Purchased used, and fairly beat-up.) I got a fair amount of miles out of it. I don't know how many, because the speedometer cable broke the first or second year I had it, and I never repaired it. The Wikipedia articles on these cars told me things I had not already known: P1800, 122-S. There have always been elites in America, and there have always been local ruling classes and aristocracies; but it is only comparatively recently that there has been "a ruling class" of the kind we have now. Codevilla traces its development and some of the consequences. This development was predictable and predicted. The authors of The Bell Curve understood the phenomenon, and postulated some of the causes; of course the development of the ruling class was well under way when The Bell Curve was published, and interestingly enough the establishment, although created in large part by the process described in The Bell Curve, soundly and roundly rejected the book, its principles. and everything about it. That's because the authors of The Bell Curve were not part of the ruling class and never could be; and besides, part of their thesis was wrong. The US hasn't become a meritocracy; but the pretense of creating one did bring together the elements of the ruling class. Some of this development was, if not predicted, at least strongly implied in some of my earlier papers on The Voodoo Sciences, all written long before the current crisis or indeed before "the global warming consensus." And of course there's The Iron Law. Codevilla's thesis isn't all that new (nor does he claim it to be) but this presentation is done well. It's particularly relevant on what has to be done. The main thesis of Codevilla's article is that America's majority -- an overwhelming majority -- is not represented by the Ruling Class and is increasingly unhappy with it -- and the remedy is not merely turning the Democrats out in November. The storm clouds are gathering. Important as they are, our political divisions are the iceberg's tip. When pollsters ask the American people whether they are likely to vote Republican or Democrat in the next presidential election, Republicans win growing pluralities. But whenever pollsters add the preferences "undecided," "none of the above," or "tea party," these win handily, the Democrats come in second, and the Republicans trail far behind. That is because while most of the voters who call themselves Democrats say that Democratic officials represent them well, only a fourth of the voters who identify themselves as Republicans tell pollsters that Republican officeholders represent them well. Sooner or later, well or badly, [the national] majority's demand for representation will be filled. Whereas in 1968 Governor George Wallace's taunt "there ain't a dime's worth of difference" between the Republican and Democratic parties resonated with only 13.5 percent of the American people, in 1992 Ross Perot became a serious contender for the presidency (at one point he was favored by 39 percent of Americans vs. 31 percent for G.H.W. Bush and 25 percent for Clinton) simply by speaking ill of the ruling class. Today, few speak well of the ruling class. Not only has it burgeoned in size and pretense, but it also has undertaken wars it has not won, presided over a declining economy and mushrooming debt, made life more expensive, raised taxes, and talked down to the American people. Americans' conviction that the ruling class is as hostile as it is incompetent has solidified. The polls tell us that only about a fifth of Americans trust the government to do the right thing. The rest expect that it will do more harm than good and are no longer afraid to say so. Beyond patronage, picking economic winners and losers redirects the American people's energies to tasks that the political class deems more worthy than what Americans choose for themselves. John Kenneth Galbraith's characterization of America as "private wealth amidst public squalor" (The Affluent Society, 1958) has ever encapsulated our best and brightest's complaint: left to themselves, Americans use land inefficiently in suburbs and exurbs, making it necessary to use energy to transport them to jobs and shopping. Americans drive big cars, eat lots of meat as well as other unhealthy things, and go to the doctor whenever they feel like it. Americans think it justice to spend the money they earn to satisfy their private desires even though the ruling class knows that justice lies in improving the community and the planet. The ruling class knows that Americans must learn to live more densely and close to work, that they must drive smaller cars and change their lives to use less energy, that their dietary habits must improve, that they must accept limits in how much medical care they get, that they must divert more of their money to support people, cultural enterprises, and plans for the planet that the ruling class deems worthier. So, ever-greater taxes and intrusive regulations are the main wrenches by which the American people can be improved (and, yes, by which the ruling class feeds and grows). There's a lot more, some of which you will have encountered here, such as Adorno's influential book that few have ever heard of, and other stuff from the Voodoo sciences, or our discussions of education. [The] greatest difficulty will be to enable a revolution to take place without imposing it. America has been imposed on enough. Ever-greater taxes and intrusive regulations are signs that the rulers fear and mistrust the people. The occasional victory for liberty, e.g. the Heller case, shines like a lantern in the darkness. And of course all the usual ruling class suspects are trying to extinguish that. TAXES ARE FOR THE LITTLE PEOPLE (CONT’D): Sen. John Kerry Docks Luxury Yacht In Rhode Island To Avoid High Massachusetts Taxes. A reader calls it “not-so-swift” boating. Yeah, you have to be grateful for John Kerry, who illustrates the problems with his class so well, and who isn’t bright enough to hide it. UPDATE: Check out the Boston Herald front page, which is giving it the full Thurston Howell treatment. There's more at the WBZ-TV website, with videos and comments. Kerry is doing that thing Obama does, where he says "It's not an issue." and expects that all who hear will obey. By the way: in case you have not clicked those links yet, that's a $7 million yacht, making the Senator liable for close to half a million dollars in Massachusetts use tax. Will he pay the $70,000 annual property excise? I suspect not. I wonder why a Massachusetts Senator would have a yacht designed in Rhode Island and built in New Zealand? Are there no yacht builders in Massachusetts or any nearby states? Has he been in Washington so long that he has forgotten that seven million dollars might make a difference to the economy of the state he represents? Represents in some sense. Local boosterism is so déclassé, isn't it. And it's all about the class. Ruling class, that is. underworld tattoos—those useful inkblots that indicate to those in the know who you were in prison with, and why, and what kind of employment you might be seeking, all without the trouble of taking out an ad in the classified section. Follow up with mad scientists. J. Christian Adams is writing about this case at PJ Media. How will the DOJ deal with this one? This story hails from rural east Mississippi: majority black Noxubee County is home to Ike Brown, one of the most lawless purveyors of racial discrimination the nation has seen in decades. (I have written in greater detail about the racially motivated lawlessness Brown used to victimize minority white voters in the county.) Brown canceled ballots cast by white voters. He stuffed the ballot box with illegal ballots supporting his preferred black candidates. He deployed teams of notaries to roam the countryside and mark absentee ballots instead of voters. He allowed forced assistance in the voting booth, to the detriment of white voters. He threatened 174 white voters by declaring that if they tried to participate in an election, he might challenge them and not let them vote. He publicized the 174 names. Brown’s overall behavior was so outrageous that the court stripped him of all authority to run elections until 2012, and gave the power to a former justice of the Mississippi Supreme Court as a special administrator. The remedy was unprecedented, but upheld on appeal because of the brazen lawlessness of Ike Brown. Fast forward to 2010, to the Eric Holder Justice Department. Every change in voting in Mississippi must be submitted for approval to the DOJ voting section — where I worked for five years — under Section 5 of the Voting Rights Act. Section 5 gives the DOJ power to object to any change motivated by a discriminatory racial intent or with a discriminatory racial effect in nine states and portions of seven. Changes to the law in 2006 made it clear that any discrimination would suffice to trigger an objection under the act. Right now, the Holder Justice Department has a submission from Ike Brown to allow him to do precisely the same thing he tried in 2003 — prevent people from voting based on their party loyalties. The Department must decide this week if white victims are worth protecting, by imposing an objection to the same behavior a federal court has already ruled was motivated by an illegal racial intent. If the races were reversed in this submission, there is zero doubt the DOJ would object to the proposal. On July 12, it silently sent a “no determination” letter, effectively a cop-out against using Section 5 to protect the white minority in Noxubee County. I am told by a news outlet that the supposedly transparent administration played hide the ball for almost 24 hours, not providing the letter to the public. There’s more. On July 13, it filed a motion to extend for a few years a remedy in the civil court case the Bush administration brought in 2005 and won in 2007. The order seeks to extend the remedy until after the next presidential election. This means the Department will never have to roll up their sleeves and monitor what Ike Brown, their political friend, is doing in Noxubee. Amazingly, the Department is also seeking an order from the federal court to prevent Ike Brown, the discriminator, from making any more inconvenient submissions to the Obama Justice Department which might reveal the hostility toward equal enforcement of the law. Simply put, they are asking the court to prohibit Brown from sending any more submissions under Section 5. Not only would this go beyond the powers of the court to order, it is a naked play to avoid facing the issue of unequal enforcement for the remainder of the first, and maybe last, term of the Obama administration. If Brown can’t file submissions to the DOJ, the DOJ won’t have to take the side of the white victims. This is unnecessary and shamefully transparent. That whole thing was so transparently crooked ... The Democrats are utterly without shame at this point. Cash in the freezer, ballots in the trunk of the car, who cares. … to threaten industry and prosperity. First, it was Waxman-Markey; then it was Boxer-Kerry; now it's Kerry-Lieberman; but it's all cap 'n' trade. Left to right, Kerry, Obama, Lieberman. Al Gore is out of the frame. If it passes, it will be the American economy that's the zombie. But the Chicago Carbon Exchange will be doing fine. which reminds me of someone. Illegal alien is illegal. It's not hard to understand. I'm old enough to remember when legal aliens were required to register at the Post Office annually. We are unwilling to enforce our own immigration laws. The Mexican government has much stricter immigration laws, which they enforce. J. Michael Waller in 2006: Mexico's Immigration Law: Let's Try It Here at Home. Cory Doctorow thought he had all his ducks in a row. "Better late than never, dear"
Someone's already put up a website. I put that language warning right in the title so it would not be missed. This is ugly stuff. Alternate title: Democrats are such lovely people. Video at the link. When they say that the Tea Partiers are racist and violent, it's projection. And, of course, deflection, distraction, and deception. An all-but-overlooked provision of the health reform law is threatening to swamp U.S. businesses with a flood of new tax paperwork. TaxProf has more links. Warren Meyer has a post: Horrible New Paperwork Requirement Slipped into Health Care Bill. I guess we had to pass the bill to find out what was in it. I wonder who inserted this provision, and what in the world it is supposed to have to do with health care or health insurance, or anything but destroying the private sector. They are saying it may erupt again. This, you see, is geoengineering, as done on the large scale, by Gaia herself. Piddling plans of self-styled climatologists to launch particles into the atmosphere to raise the Earth's albedo, to block those deadly warming rays from the Sun, are shown up as the silliness they always were. If we get another Tambora event ("eighteen hundred and froze to death") out of this volcano, will the cap 'n' traders and greenies finally realize that warmer is better? I expect not. There's too much money already invested in the contrary view. So the Waco massacre of the Branch Davidian children was not entirely Janet Reno's doing, after all. She ran the notion past President Bill Clinton, first. There's a fairly vigorous discussion going on at Althouse. Warning to Young People. Go, listen, read. And get off my lawn! QuickTime is a pain in the neck. What do you do? Sooner or later you find this page: How do I stop QuickTime from playing audio files in my browser? Follow the instructions, and then, ahhh, the sigh of relief. I was about ready to go to California, find Steve Jobs, and, well, I won't continue with that. Programs should not highjack file associations. I say that unequivocally. Furthermore, QuickTime is not a good player of mp3 files. It stutters too much. And what good is that, I ask you? Apple, mend your ways. And your software. I suppose you'd want to imagine a man singing this, since it was written by Jimmy McCarthy. Yet this version by Mary Black is the canonical one, to my mind anyway. Lyrics. Lit-crit explication is beyond me, as with much of the modern Irish pop music. Too densely personal, too obscure, for easy comprehension. I like the sound of it. An open letter from Neil Armstrong, Eugene Cernan, and 25 other astronauts, about Obama's new direction for NASA. They don't like it. We are seeing the abolition of the manned space program. When Neil Armstrong speaks out, that’s an event. This is a guy who is the most self-effacing American hero in our history. He could have been Lindbergh and he became J.D. Salinger. And now he speaks out in an open letter together with [Eugene] Cernan, the last guy that walked on the moon, and James Lovell, the commander of Apollo 13. And they are saying that the program that Obama has abolished — has cancelled — is essentially the end of man in space. It turns NASA into an R&D agency for pie-in-the-sky ideas like having humans on asteroids and ends its role as the agency that actually gets us into space, even low-Earth orbit and back. Obama spoke about — we’ve done the moon, so we are going to do asteroids and Mars. This is total pie in the sky. On what rocket? With what space capsule? With what simulators? With what training program? There’s nothing here of substance. And when Kennedy committed us "in this decade," as he said, he meant it within his presidency. He intended to be — he expected he’d be — president until January 1969. Obama is talking about 2025, 2030. All of this is total speculation. All the private stuff [launching humans into space] is complete speculation. What we’re doing is we're ceding the certainty of access into space. We are not going to have it. The Russians will have it. The Chinese will have it. And we'll look up in a decade and there’s going to be a lunar base ... [there are] not going to be Americans on it. "Mr. President, is a strong America a problem?" The president is looking to eliminate the last vestiges of the Reagan-era buildup. Once the wars in Iraq and Afghanistan are “ended” (not “won”), the arms control treaties signed, and defense budgets held at historic lows while social entitlements and debt service rise to near-European levels, the era of American superpower will have passed. And the question is, Are the first two things related to the third thing? Private space development would be great. But what Krauthammer says about ceding the certainty of space is not speculative. Will NASA and the FAA and the rest of the government get out of the way of private space efforts? Encouragement would be too much to ask for. 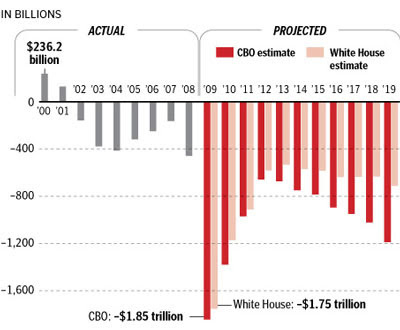 "Wait, so here's an area where Obama would just as soon not spend $230 billion (likely more, because, remember, the shuttle program ultimately came in at a 55% cost over-run), and the same people who scream about the exploding deficit are saying we need the program, we need to spend the money? This just proves that nothing Obama could do would appease these people." This is the kind of thinking that comes from someone who would eat the seed corn, or skip the oil changes to buy spinner hubcaps and mag wheels. Speaking of wheels, I'm inclined to agree that NASA has been spinning its wheels for years, as a result of being run by pork-minded bureaucrats who have lost sight of the mission, but what's called for is not abandonment of the mission, but a return to it. As I said in an earlier post, "Men will go to space; but no law of nature requires that they be Western, or free." There are a couple of fairly zingy comments by yours truly on that Althouse thread.